Hadean Eon is often regarded as the period when the Earth was formed. The International Commission on Stratigraphy does not recognize officially this period as no real strata of this period were found existed. All these divisions were done based on the moon’s geology as there was no proof of survival of the Earth’s surface. It was also although that the moon was devoid of water and wind and suffered from lower volcanic activities. These details of the moon have been preserved which have lost on the present Earth. Also known as the ‘Hidden’ period, this Cryptic period is called as the earliest phase of the Earth. This period is estimated to last from 4.56 to 4.50 billion years ago. It is named as ‘cryptic’ because the moon is also devoid of any preserved details of this time. Even, it is also thought that the moon was formed at this cryptic period. The information and knowledge to describe this period are mainly based on the studies and calculations of meteorites and their physical models. How the Earth was formed during this Cryptic period? It is highly presumed that about 4.56 billion years ago the solar nebula gave birth to the Earth. Due to gravitational force matter aggregated into clumps and they started grew in size when they attracted more materials. Though no accurate or real knowledge was found to measure the time of formation of the Earth but as per computer models the planet formation process was rapid and it might took a couple of million years to complete the process. The meteorites of the oldest basaltic period support this theory that it took really less time to form the Earth and the solar system. High temperatures and great pressures were responsible for the formation of basalt and the planetesimals exist at their cores very early. How the Earth was during the Cryptic period of Hadean Eon? As a result of its violation of formation the earth was initially molten. Meteorite impacts, gravitational compression, and radioactive decay of potassium, thorium, and uranium generated heat. Iron and similar heavier elements began to sink towards the earth’s center as temperature started to increase and it began to cross iron’s melting point, which is about 1500 °C. This phenomenon is called as iron catastrophe and this had partial contribution to the formation of iron-rich core of the Earth. Also, gravitational potential energies were released due to the falling of heavier elements to the Earth’s core. 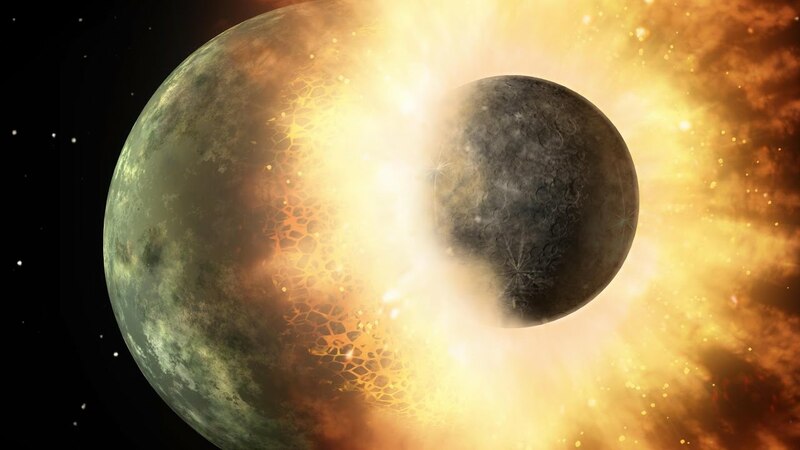 This might had raised the Earth’s temperature by some 1000 C. It is also believed that the Earth suffered from a collision with a huge planetesimal, often knonn as Theia and resembles the size of Mars. From this impact the Earth gained a good percent of its mass, say about 10%. This finally gave birth to the moon and this process of the formation of moon was thought to take about 10-15 million years. Apart from this large collision of the Earth with the Theia there were other evidences too of collision of other planets. The Cyptic period ends with the completion of the Earth. However, it was presumed that after 60 to 80 million years of its formation the Earth reached its stage of completion with 99% of its present mass, a moon, and a rich core of nickel and iron. Impacts of comets on the Earth and the out gassing of rock are responsible for the formation of water though in the form of vapor. This is relatively a long period covering 550 million years timeframe and lasted about 4.50 to 3.80 billion years ago. As there were lack of evidences of rocks of this period the lunar geology is the major source for extrapolating the Earth’s happenings of that time. However, despite of major researches the early history of the moon was still not very clear. The rocks which were discovered from the lunar highlands were the oldest. It was thought by the geologists that the lunar crusts were melted and re melted due to the higher frequency of the early impacts. It is estimated that about 4.4 to 4.2 billion years ago the features of the lunar crust were stabilized and differentiated from those of present day lunar crust. Hence it can be said that this phase was the cryptic period of the moon and due to frequent impacts the surface of the moon was not solid and even frequently liquefied. But the period also left some older rocks which were found scattered throughout the moon’s surface. Also, erosion did not take place on the surface of the moon and as a result many of the rocks survived. What were the impacts on the Earth? The Earth suffered from a higher frequency of the impacts. The zircons and other oldest rocks found on the Earth were known to belong to this period. It was also thought that there was proto crust at the Earth and the crust was basaltic in nature. Summing up, it can be said that the Earth continued cooling at the Basin period and the liquid water first appeared probably 4.4 billion years ago paving way to life. Lasted from 3.95 billion – 3.85 billion years ago the Nectarian era is a small part of the Hadean Eon. The phase called Late Heavy Bombardment started at this period and continued to the Imbrian. Thought to have lasted from 3.85 billion – 3.80 billion years ago, this Imbrian period is the concluding part of the Hedean Eon. There are two distinct phases of this period and each characterized by their respective features. 2 large craters, the Orientale and Imbrium marked the Early Imbrian.